The U.S. Mint has shared its first official weekly sales numbers for the 2016 American $1 Coin and Currency Set, released on Thursday, June 16. As of Sunday evening, the item had sold 24,497 of its 75,000-set mintage, an increase of 3,348 units since the first-day total was reported on Friday. This marks a softer launch than was seen for the 2015 Coin and Currency Set. That set sold 44,344 on its first day and added 7,261 sales over the next week (it debuted on a Monday, so it had three more days for orders to accrue). Part of the strength of the 2015 launch can be attributed to concerns that the issue would sell out within a day or two, as the 2014 sets were scooped up quickly after the Mint confirmed the inclusion of an exclusive Enhanced Uncirculated Native American dollar coin. 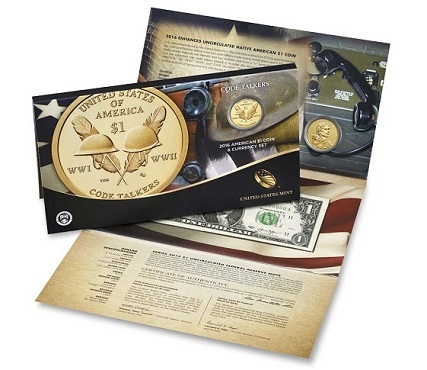 Last year’s Coin and Currency Set was given the high mintage limit of 90,000 units, however, and is still sporadically available on the U.S. Mint’s Web site. So while the 2016 issue sold about 27,000 fewer sets in its first week, it’s possible the lack of a much-hyped launch event has encouraged some interested collectors to take their time with their purchases, leading to greater sales consistency in the weeks ahead. I was so happy when this didn’t sell out in the first day. I was at work and unable to get to a computer when released. The next day I was able to log in and buy one that will be forever in the collection. I believe the higher mintage than ’14 scared away a lot of flippers (no disrespect to the flippers) and made it possible again for the collectors who have actually been working on this series. I’m not sure how long this series will go, but now I can rest easy for the next year knowing I won’t have to pay double on the second-hand market for this issue! Its not the mintage limit..its the crappy design.